This gloomy winter is killing us and just won’t end. The kids are on spring break. We have nothing planned. We need to get out of town and do something quick, easy, and fun that can make everyone happy. 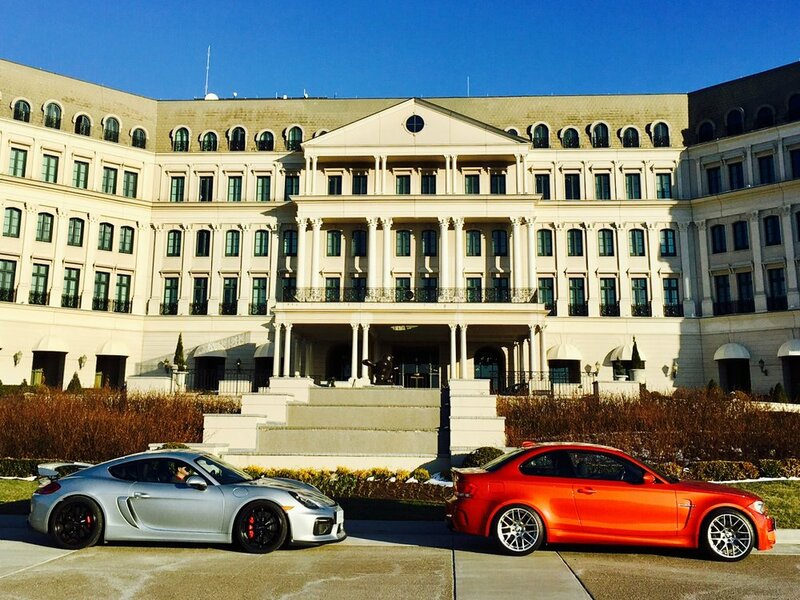 Enter a new option: Nemacolin Woodlands Resort. It’s only a few hours driving from DC to Western PA (with some great driving roads in between), has a great spa which my wife will love, has several restaurants on site so we don’t need to pack or plan much, and has tons of on-site activities: ropes course, climbing walls, golf, mini-golf, zip-lining, zoo animals, shooting range, casino, car museum, and even an off-road course with Jeeps onsite. Really, just those last two and the drive there was enough for me. So, how do two families with six kids take a fun road trip? Take 3 cars. Bored of who you’re talking to? Switch cars. Sibling driving you nuts? Switch cars. Whatever your problem: time for a pit stop and driver change. We left DC and rendezvoused with the other family at Oak Stone Pizza in Winchester VA (which was awesome). From Winchester, we took 522 north out of town and then cut northwest on routes 127/29 /51 towards Cumberland, MD, before heading along Rt 68 and 40 to Nemacolin. 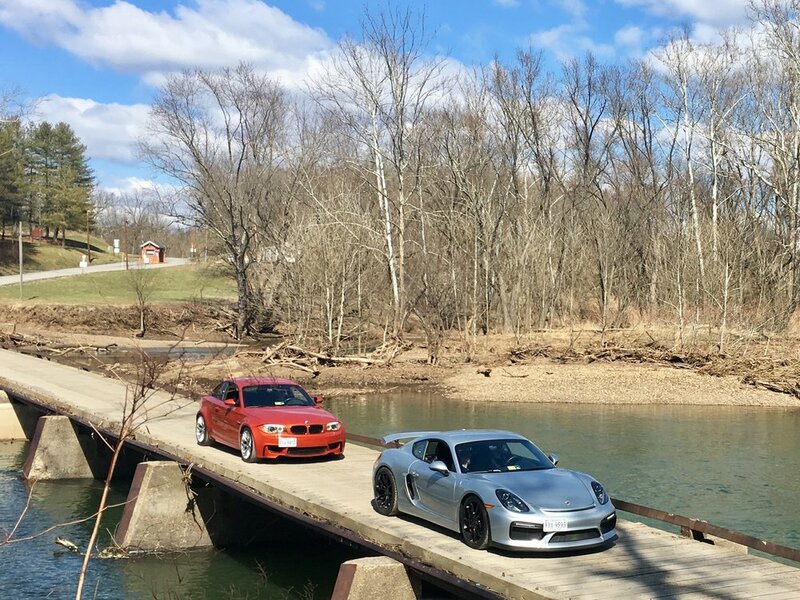 I started the drive in one of my all-time favorite drivers’ cars, the Porsche Cayman GT4. Heading off the main highway allowed me to experience the aural delights of the GT4’s 3.8 liter flat-six. All Porsche flat-six engines sound distinct but something about the GT4's exhaust just screams racecar in a way that I haven’t experienced before - and in a car that’s so fun to drive on both the street and track. The mechanical noises this car makes are completely addictive as is the satisfaction that comes from clicking through the precise gear changes in the six speed manual. We crossed the north fork of the Potomac River on a wooden toll bridge and pit-stopped to stretch our legs with a stroll along the C&O canal near Green Spring, WV. After the stop, I jumped into the BMW 1M which I hadn’t driven for a few weeks. By comparing cars back to back your body senses the immediate differences and sensations from one car to another in a way that’s impossible if there’s any time between drives. Immediately the seats on the 1M felt more comfortably bolstered but the seating position felt awkwardly high for the first few miles until my body adapted. The 1M sounded sporty as it started up, but after the initial startup, the exhaust is somewhat muted compared to the GT4. One thing the 1M has in spades over the GT4 is torque - the twin turbo 3.0 liter takes just a few RPM to build power and then a wave of torque presses your back into the seat. With shorter gears and more torque the 1M certainly feels faster on the street, though I’m sure the GT4 must be faster around a racetrack. Another benefit of the 1M is the rear seats - which might seem small to most people but are voluminous compared to the 911 seats our youngsters are used to. I love comparing these cars because they are completely different but born of the same recipe: take the go-fast parts of the bigger sibling and stuff them into the smaller car and only offer a manual transmission. The third car in this journey was our practical hauler: the Tesla Model S. It dutifully carried family and luggage without noise or complaint. The 1M and GT4 drivers would accelerate hard to enjoy the excitement of exhaust and gear changes only to look in the in the rear view mirror as the Model S easily kept pace. The surging acceleration and mountain climbs took a toll on battery range but with a free Tesla Super Charger a few miles up the road and the Model S continuously re-calculating range, we knew we had electrons to spare. While the Tesla can make the drive from DC to Nemacolin without stopping, there are three Tesla Super Chargers along the route in case your right foot is a little heavier than anticipated. After a 20 min stop for snacks, gas, and electricity at a combo Sheetz plus charging station, we were on our way. Once at Nemacolin, the kids checked out the petting zoo while I tried my hand at off-roading in a Jeep Rubicon. On an initial test course we sampled the Jeep's core capabilities: steep approach/departure/rollover angles, high ground clearance, and deep water fording. Then we hit the wooded trails, rock crawling along a wide variety of off road terrain that I didn’t realize was passable by anything other than a mountain goat. To a newbie off-roader, the Jeep off road course was totally worth doing. Unfortunately mother nature decided spring hadn't quite arrived and cold rain kept us from exploring many local driving roads and other outdoor activities at Nemacolin. Before we headed back we took full advantage of the indoor pools and brunch before taking the shorter highway route home. Our road trip managed to banish the winter blues away.